Having finished our sojourn through the BCS conferences, we now turn our attention to the little guys. We'll begin with Conference USA. Here is the link to last year's Conference USA post. First here are the 2012 Conference USA standings. 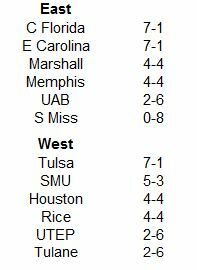 And here are the 2012 Conference USA SDPI standings. The standings are sorted by division by total SDPI with ranking for each category (out of 12 teams) in parentheses. Don Williams would have been proud because for the first time 2005, the champion of Conference USA was living on Tulsa time. The Golden Hurricane served to bookend this era of Conference USA football, winning the first ever Conference USA Championship Game in 2005, and winning the last of this current iteration of Conference USA football. The league will look a little different in 2013, as Central Florida, Houston, Memphis, and SMU head to the Big East (or American Athletic Conference) and Florida Atlantic, Florida International, Louisiana Tech, Middle Tennessee State, North Texas, and Texas-San Antonio join the league, giving it a robust fourteen members. Marshall moved the ball with ruthless efficiency against their league brethren, but had a difficult time stopping opponents, and their resulting games, while entertaining, ended in defeat too often for a postseason invite. A 2-4 record in one-score games, as well as a non-conference schedule that featured three bowl teams also conspired to keep the Thundering Herd home for the holidays. There wasn't a great deal of disconnect between the actual standings and the SDPI ratings, but Rice is probably the answer here. The Owls were wholly unimpressive on both sides of the ball and three of their four league wins came against Southern Miss, Tulane, and UTEP, a trio than combined for a 4-20 league record. The Herd gained over 600 yards in three league games and topped the 500-yard barrier five times. The Tigers appeared to get things together as the season wore on. In their first four league games during which they went just 1-3, Memphis averaged 272 yards per game. In their final four league games during which they went 3-1, Memphis averaged 382 yards per game. Like the offense, the defense improved in the second half of conference play. The Tigers allowed 357 yards per game through their first four, but just 306 per game over their last four games. The defense was bad, very bad, but at least things got better. In their first conference games, the Green Wave allowed 651 yards to Tulsa. They would not allow that many yards to another team all season. June Jones has done an admirable job since taking the reigns of the Pony Express at SMU prior to the 2008 season. His charges have played in four consecutive bowl games, after missing out on the postseason for nearly a quarter century, have finished with a winning league record for four straight years, and even won their division in 2010. Not only that, but the Mustangs will be putting on their big boy pants (sort of) and moving on to the American Athletic Conference in 2013. But perhaps the most impressive thing June Jones has done at SMU has been to craft a distinct homefield advantage. Over the past four season, SMU has lost just a single time to a league foe at home. In that same span, they have gone just 7-9 on the road in conference play. That compares quite favorable to the homefield advantage enjoyed by Hawaii during Jones' final four seasons on the islands. SMU may not win the former Big East conference, but their home conference opponents, who all play on the east coast (Rutgers, Temple, Connecticut, and Central Florida), had better beware. I promised the 2012 reviews would start coming Fast and Furious. This marks the final BCS conference review as we finally examine the SEC. Here is the link to last year's SEC post. 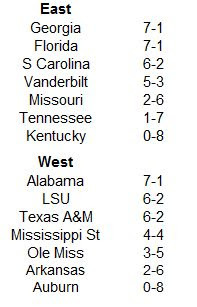 First here are the 2012 SEC standings. 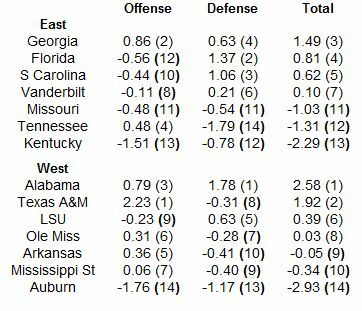 And here are the 2012 SEC SDPI standings. The standings are sorted by division by total SDPI with ranking for each category (out of 14 teams) in parentheses. The 2012 SEC marked the first time any BCS conference featured 14 teams. And while there was a great deal of heft at the top of the league, there were also some serious millstones at the bottom. Both Auburn and Kentucky went winless in the conference. For Auburn, it marked their first winless league campaign since 1952! As a point of reference, both Georgia Tech and Tulane were in the SEC back then. For Kentucky. one does have to go back quite as far. You knew the Arkansas Razorbacks were in for a rough year after a tumultuous offseason that saw their coach fired in disgrace, a psychopath hired in his place, and an early loss to Louisiana-Monroe. However, the Hogs were not quite as bad as their record showed. Tight losses to Ole Miss and LSU and an in-conference worse turnover margin of -13 ensured Arkansas would miss out on a bowl for the first time since 2008. LSU continues to defy the odds under Les Miles. Despite another season of middling peripherals, the Tigers won 75% of their league games and were 5-2 in one-score conference games. Under Miles, the Tigers are an amazing 25-11 in one-score conference games. Call him clutch, call him lucky, call him insane, but the man gets things done in tight spots. 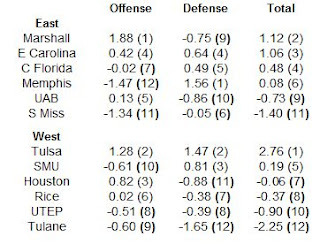 The league newcomer lead by eventual Heisman winner Johnny Manziel, absolutely shredded SEC defenses. After being held to 334 yards in their conference opener, the Aggies averaged an incredible 577 yards over their last seven league contests and topped 600 yards four times. 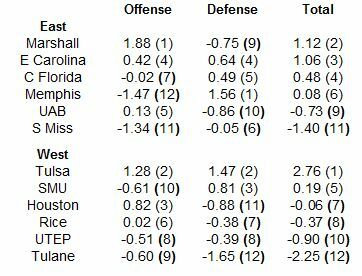 Texas A&M's lowest offensive output in the conference (334 yards against Florida) would have represented about 100 yards more than Auburn's average SEC output. LSU, Texas A&M, and then Georgia in the SEC Championship Game proved the defense was not impenetrable, but it sure seemed that way through their first five league games where the Tide held opponents to just 204 yards per game and allowed just four offensive touchdowns. The Volunteer offense was pretty good (ranking fourth in a strong league), but the defense was an absolute turnstile. Every conference opponent, even a woeful Kentucky squad, topped 400 yards against the Vols. Some might say this is lazy, but I just feel I wrote a great article a few months ago. Head on over to College Football by the Numbers to check out a little something I wrote about Les Miles and the spread. You won't be disappointed. Sorry for the hiatus, but we're back with our offseason SDPI previews. I promise the next seven will go a lot faster than the first four. In this installment we tackle the Pac-12, a league that has sent two teams (and the same two teams I might add) to the BCS in each of the past three seasons. Here, as always, is a link to last year's Pac-12 post. First here are the 2012 Pac-12 standings. 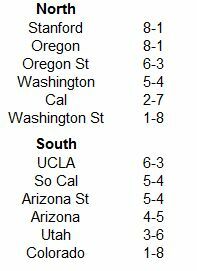 And here are the 2012 Pac-12 SDPI standings. The standings are sorted by division by total SDPI with ranking for each category (out of 12 teams) in parentheses. For the first time since 1999, the Stanford Cardinal won the Pac-12. Though they ranked a notch below the powerful Oregon Ducks, Stanford shut Oregon down in their head-to-head matchup (just their second win in the series since 2001) and won the division title and the opportunity to win the overall crown in the Pac-12 Championship Game. In other minutiae news, UCLA became the first school to play in the Pac-12 Championship Game more than once. Despite their disappointing season, the Trojans from Southern Cal actually played at a relatively high level. The Trojans were above-average on both sides of the ball, but were 0-2 in one-score games, lost to three teams that finished the season ranked in the top-seven, and didn't show up for their bowl game in El Paso. Certainly, they were a major disappointment after beginning the season ranked number one, but they were far from your ordinary 7-6 also-ran. 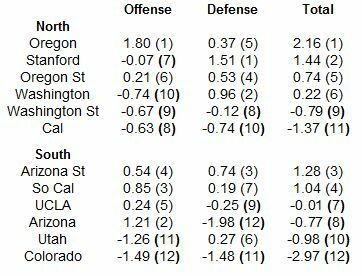 No one in the Pac-12 significantly outperformed their peripherals, but UCLA rated out below both Arizona State and Southern Cal in their division, despite winning the crown. The Bruins can thank a 3-1 record in one-score (regular season) conference games, including an exciting 45-43 victory over Arizona State that ultimately decided the division championship. The Ducks rolled up over 400 yards of offense in all nine of their league games and topped the 40-point barrier in each game save their loss to Stanford. The Buffs opened conference play by gaining 531 yards in a win against Washington State. They averaged just 279 yards per game the rest of the way and did not win again. Arizona and Oregon gouged them (by their lofty standards at least) totaling over 1000 yards against the Cardinal defense. However, the other seven Pac-12 foes could only muster an average of 274 yards per game against Stanford, making those seven teams the equivalent of Colorado when they faced the nerds from Palo Alto. It took a lot to be worse than Colorado at anything in 2012, but Arizona was up to the challenge. Four conference opponents gained over 600 yards against the porous Wildcat defense, and only one team failed to top 400 yards of offense. What to Make of Arizona State? The 2012 Sun Devils are a hard team to figure out. On the one hand, they ranked 3rd in SDPI, behind Oregon and Stanford. On the other hand, each of their five conference victories came against the bottom five teams in SDPI. However, their wins were usually convincing, as only one was by a single score, and they came by an average of 24 points per game. But when the Sun Devils stepped up in competition, they were more South Park Satan than powerful Prince of Darkness. In their four league losses, against teams ranked first (Oregon), fourth (Southern Cal), fifth (Oregon State), and seventh (UCLA), only one was close (the two-point loss to UCLA). The other three came by an average of nearly 18 points per game. Perhaps Dennis Green said it best, 'they are who we thought they were'. The Sun Devils were equivalent to a seventh grade bully in 2012, towering over the other kids on the playground with inhalers or who had yet to enter puberty, but not in the same class as the high school kids they long to emulate.